You are here: Home / Galaxy Note 4 How-To Guides / How to set storage location for Galaxy Note 4 camera? [easyazon_block add_to_cart=”default” align=”left” asin=”B00IVPU7AO” cloaking=”default” layout=”top” localization=”default” locale=”US” nofollow=”default” new_window=”default” tag=”net7749-20″]Run out of phone storage? You can save Galaxy Note 4 camera photos and videos to SD card. One of the advantages of Samsung Galaxy devices over some other Android devices is the SD card slot, which allows you to expand the storage affordably. Galaxy Note 4 is not an exception. Actually, Galaxy Note 4 supports micro SD up to 128GB. So, you should not worry about the storage when using Galaxy Note 4 camera. By default, after you insert a micro SD card to Galaxy Note 4, the photos and videos will be saved to the SD card automatically. So, you may use the micro SD card for Galaxy Note 4 camera photos and videos without any settings. But it is always a good idea to check whether the micro SD card is actually used for your photos and videos. How to check whether device storage or memory card (SD card) is used for Galaxy Note 4 camera? Start Camera app on Galaxy Note 4. In the top right (landscape orientation) corner, you can notice several icons. 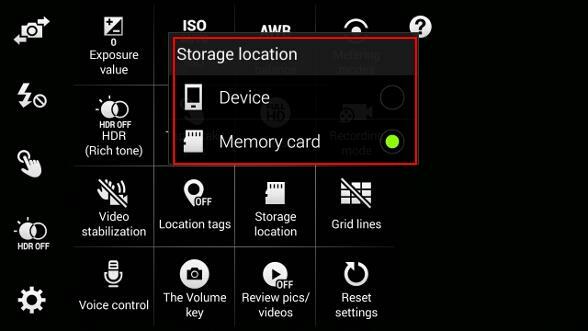 If the current storage location for Galaxy Note 4 camera is memory card (i.e., micro SD card) , the memory card icon will be displayed as shown below. If the storage location is device (i.e., internal storage), there will be no icons for it. So, you can quickly check the icons in camera app to find out whether the photos and videos will be saved to the device or to the memory card. At anytime, you can change the storage location for Galaxy Note 4 camera photos and videos. All new photos and videos will be saved the new location. This setting does not change the existing photos and videos. In other words, this setting does not move you existing photos or videos. You can use My Files app in your Galaxy Note 4 to move the existing photos and videos. 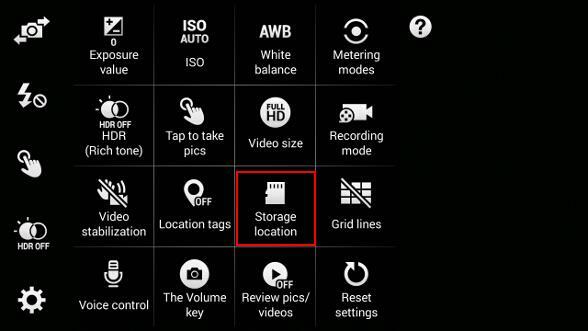 To set storage location for Galaxy Note 4 camera, you may follow these steps. tap Settings (gear icon) — More (…) as shown below. Tap Storage location as shown below. Device. Photos and videos will be saved in Galaxy Note 4 internal storage. Memory card. Photos and videos will be saved in the Micro SD card. Tap any locations on the screen to return. Why there are some photos still saved in internal storage, although the storage location is set as memory card? Photos are taken for S Note’s photo note. Can you set storage location for Galaxy Note 4 camera now? If you have any problems or questions to set storage location for Galaxy Note 4 camera, please post them in the comment box below. Hello, I have an sd card in my note 4 a day have the photo and video destination set to go to there. However, my phone is running out of device memory so have been trying to free up space. It seems that 10+GB of the total device memory used is photos and videos as is shown in “my files”. If I access and try to delete photos or videos via “my files” (I attempted this as thought the files might be duplicated from my sd card) it deletes the smell file from my sd card. Please could you tell me how to solve this?? back up, back up and back up!!! if you delete files, you need go to SD card. In My Files, under local storage, you can find internal storage and SD card. Tap internal storage if you want to delete files from internal storage. Don’t use categories, which include files in both internal storage and SD card. I am using galaxy note 4. 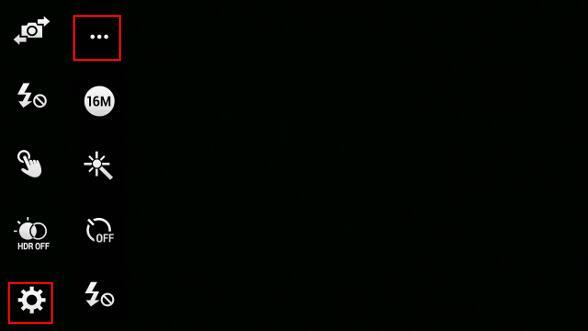 Images and videos I download are getting stored in device but I unable to view demand in d gallery. . Please suggest me regarding this..
Can you verify that the files are in the phone? How did you download them? Gallery app relies on media scanner to provide files info. You can try to reboot the phone to force media scanner to re-scan the phone. Note 4: I have my camera set to save pictures on the SD card. However, all pictures are saved both on the SD card in the DIM folder and on the phone in the DIM folder. How do I set options to save in only on the SD card? Are you sure the photos are saved twice? It is unlikely. Check the files with My Files app. I have a similar problem-I cannot find the location of images stored to internal storage of my Galaxy Note 4. Can you give me the exact location? DCIM folder. All photos taken by your Note 4 camera should be always saved in DCIM folder. It’s same for SD card. My SD card has stopped working (well it was 3 years old) and after its removal Camera has automatically switched to the Device storage. The problem is that it doesn’t store taken pictures anywhere (or I can’t find where). The Gallery app doesn’t see the taken pictures either. Any suggestions? Clear cache and clear data for camera app in Applications manager. Thank you. This helped allot. And another question: when I switched the storage place to the sd card, something changed on the camera- It didn’t let me zoom any more, and other settings – editing etc, also disappeared. Any ideas? Thank you. No, it should change them. Zoom is not available in certain modes. Edit is always available and is handled by Gallery app actually. If you cannot see the edit option tap the picture one. i set memory default to sd external, but when im in the gallery and i want to organise some pictures from camera ( saved in sd)by adding a new album, still save this new album in the memory device not in SD. How can i save this in sd card? Album should not change the location of the photos. It just change the view. I don’t think the photos are moved to your internal storage. Hi, how do you change where photos are stored when taken via the cover camera (ie: taking shots using the S cover)? It always follow your camera settings (under DCIM/covercamera folder). You cannot change it. So I transferred them to pc. They’re corrupted. I formatted card again and now it works. As for card authenticity looks and operates like it is. I don’t have the package with serial to check. anyway, it is better to format the card on the phone, not on the pc. For SD card, you’d better to get class 10, not class 4. I have a note 4 and added a 128 gb Samsung Evo micro sd card. I set camera storage to card and it saves a file to the card when I shoot. The problem is that none of the filed can be viewed. It’s like they’re corrupted. When I switch back the storage to device, it’s fine. Can you copy the file to pc to check? Is the SD card genuine? Not sure. Normally, no icon means on internal storage. Anyway, you can reset gallery app on settings – application manager – all – gallery, tap clear cache then tap clear data. This operation doesn’t affect your photos. Then try again. How do you move existing pictures on internal hard drive to the micro sd card? All of my Note 4 camera options are available except storage location (grayed out). What’s up? Did you add a SD card? Hi. I have the same issue. My storage location under the camera settings is grayed out and I am unable to select it. I do have the SD card in and am able to moves files on to it, so it is working properly. Any idea what may be going on? Thank you. Did you try to reboot the phone to see whether you can get the option? I had this same issue. First mount and unmount your sd card, then make sure you are in landscape mode. That’s what worked for me, hope it helps! you can try to clear cache and clear data for camera app.